When you are reconsidering or working together on an introduction, you should need to make notes or recommendations without really transforming anything on the slide. Using comments allows you to observe anything on a slide without modifying the slide itself. Remarks can be included and perused by the first creator or some other analysts. Select the text or click on the area of the slide where you need the remark to show up. Select the Review tab, at that point find the Comment group. Snap the New Comment command. 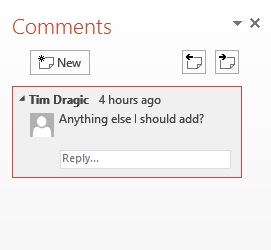 The Comments pane will show up on the correct side of the window. Sort your remark. Press Enter or click anywhere on the slide to return to your presentation. Added comments show up as small thumbnails rather than full-sized notes. To read a comment, click the thumbnail to open the Comments pane. 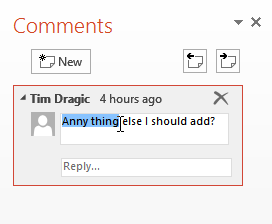 Select the comment you want to edit by clicking the comment thumbnail. The Comment pane will appear. Click the comment to edit it. Press Enter or click anywhere on the slide, and the comment will update to reflect your edits. Click the thumbnail of the comment you want to edit. The Comment pane will appear. Press Enter or click anywhere on the slide. The new comment will appear below the original comment, and a new thumbnail will appear on the slide. Select the comment you want to delete. To delete multiple comments, click the Delete drop-down arrow and select Delete All Comment and Ink on This Slide or Delete All Comment and Ink in This Presentation. On the off chance that you are working together on an introduction or requesting that another person audit your introduction, you should need to utilize the Compare feature. The Compare feature consolidates two renditions of a similar introduction. This enables you to see the contrasts between the two and choose which changes to incorporate into the last form of your introduction. Before you begin, you’ll need one rendition of the introduction open. When you’re prepared to think about, you’ll select the second form. Select the Review tab, at that point find the Compare group.